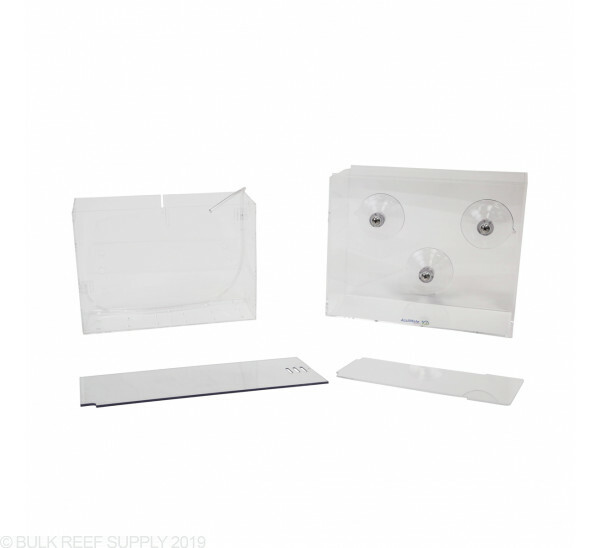 Acclimate, transport, trap and isolate your fish, corals and anemones easily and conveniently with the AccliMate from Reef Gently. The inner tanks with flow-through holes can be secured to the inside walls of the aquarium using the included suction cups. 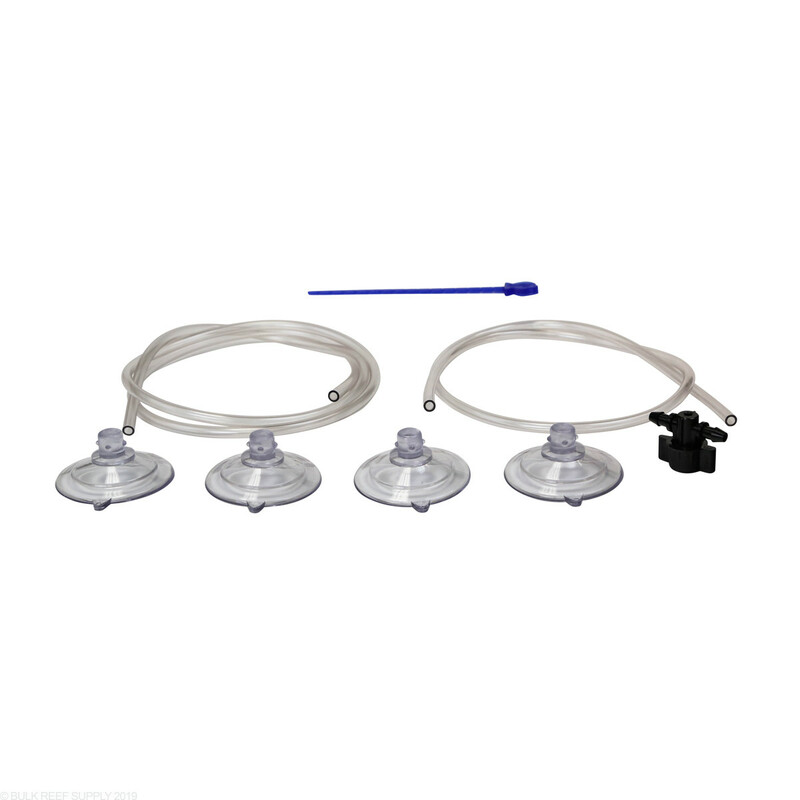 Can be used for in tank isolation, quarantine, targeted feeding and more. Follow manufacturer's instructions for best results. Like other reviewers, this broke before i ever got to use it. I followed the instructions and placed it on the side of the tank with damp suction cups and went about preparing my newly arrived box of fish. 20 seconds later it crashes to the floor and cracks the outter box. I didn't even get water in it yet. Only upside is i didn't have any fish in it when it fell. I used this for the first time last night to acclimate a yellow clown goby that has been in my quarantine tank to my DT. Worked flawlessly. Easy to set up and the suction cups on the unit worked with no problem. I had no worries that it was stable once I pressed it onto my tank. Anyone wanting to acclimate their fish to temp and salinity in a very easy and gentle way needs this product. Well executed concept. I'm not sure about all the other problems the other people said they had but I had NONE of these. The only problems I had was the line coming off from the ends of the ball valve...I bought some baby zip ties to cure this problem. As for the suction cups I have yet to have any problems. I have used mine over a year now, many times and not had any leaks or anything. I personally have my own thoughts on why these people are having problems with the suction cups but I will stay quiet as to not "insult" anyone....moving forward. I think its a great product...yes its not perfect and takes some getting use to but I like it. I also put a thermometer inside of it to make sure the temp did not change and sure enough it was exactly as the tank water temp the whole time during acclimation...I really think you should give this product a try...its great! I really enjoy the acclimate. I am glad to have it. It makes transporting fish and other little friends much easier and more comfortable. I have only found an issue when acclimating tiny crabs and snails as they can fit through the holes. When I originally got the product, the top lid was a little tight and difficult to close. After having used it, it has smoothed out and now glides fairly easily. I had one of the main suction cups keep springing a leak. Easy enough to fix temporarily while acclimating by using my fingernail to hold the screw and tightening it back on. This was fixed permanently with a touch of super glue after dry. No nets, No mess, No stress. I bought this a few years ago thinking that it would be an awesome way to acclimate fish and coral. However the one day I was acclimating some corals low and behold the suction cups broke free spilling a half gallon of water on the floor and had broke my frags. Was not happy at all. I found to get it started was a pain half of the time. what I do is put the box in a 5 gal bucket on a chair next to my tank. Then I have a air hose that goes down from the tank to the acclimate box. I control the flow with a airline valve that acts like a ball valve to control the flow. then when it has filled 6 times i pick the box up out of the bucket and place it into the water. I really wanted to give this high review, but not after it fell off the tank. I have owned this for four years and use it with all of my fish. I have had one incident of a gasket leaking which is easily fixed by tightening the screw. If you follow the instructions (lightly moistening the tank glass and suction cups) they hold tightly. Almost too tightly. When I sm done, i have difficulty releasing the suction without splashing water on myself. I would definitely reccomend this product. I do find the acclistick a bit worthless and adjust the flow via the gate valve, but for a person new to the hobby and acclimating, i think its a good tool to teach them what a good drip rate is for different animals. 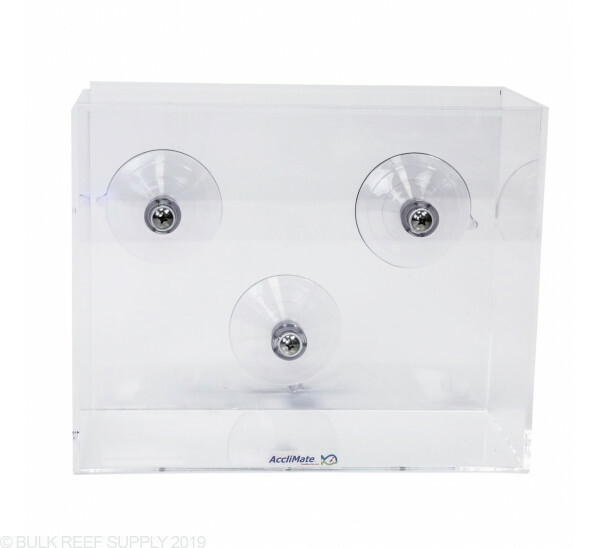 At first I was hesitant to pull the trigger on this because I'm not really fond of the idea that 3 suction cups hold up a gallon of water with expensive fish with nothing but 4-5 ft. of nothing between it and the ground. I'm here to say that so far the suction cups work like champs. I've used it quite a few times already and it stays put! 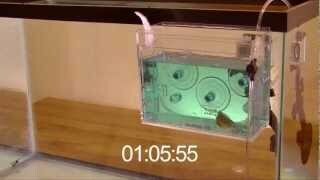 The acclimation side of the house couldn't be any easier and it does a great job of drip acclimating the fish. Transporting fish from the LFS is easy as I just have them fill it up with water and put the fish in there. From there I buckle it in with the seatbelt and I'm set. The lid isn't waterproof so a towel is needed for transporting just in case. Overall I'm very happy with this product and I would suggest anyone get it. This is an awesome concept but as others have mentioned the attachment method has flaws. Acclimates critters very slowly if needed. Can be adapted to work safely. Suction cups not great for something this heavy. Not anything I would trust. Suction cups mounted on screws !through! the side of the "waterproof" outer container. There are gaskets, but the screws into the soft suction cup really don't tighten well. I've had them pull out of the suction cups when removing it from tank, will be removing and sealing holes. For this price, give me a ball valve with push connects instead of barbed fittings since they are supposed to be attached/removed with every use. 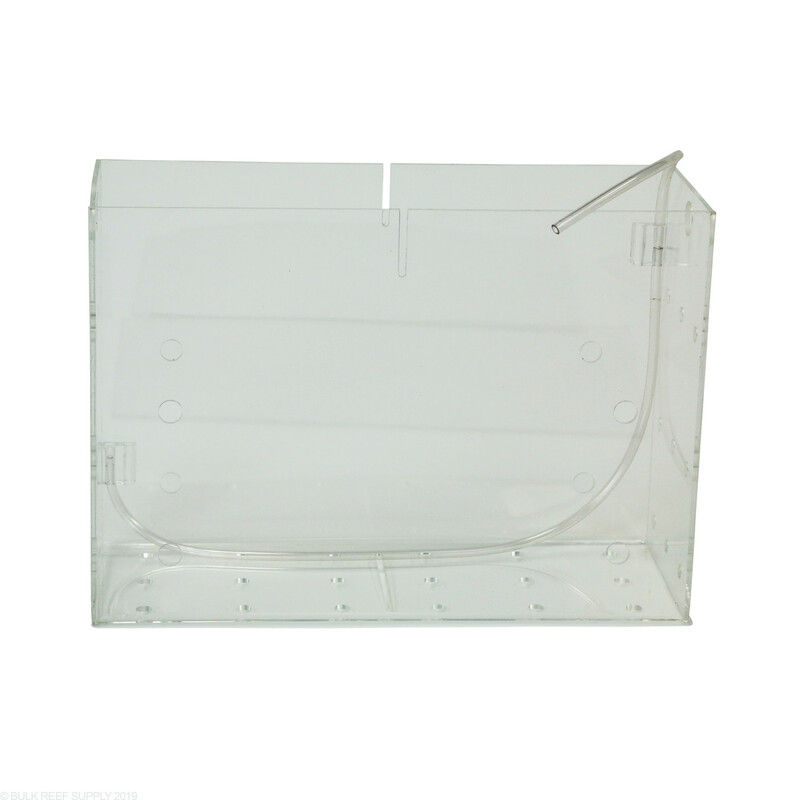 To make this safer/easier to use put something grippy (like a silicone pad) between the flat side of this and aquarium. Toss on a couple quick-grip clamps to hold it there. For extra safety I usually put it inside the aquarium so the water column helps support the weight, a little tough with some euro bracing though. Many other ways of rigging it without relying on the suction cups, I still recommend this but barely. I loved this product for acclimating fish, for the first four fish I used it on. On the fifth fish, as almost everyone else mentioned, the suction cups let go, and it, and the fish, hit the floor. When I looked at it, it had cracked the main lower seam, so my $55 dollar acclimate went in the trash. Great concept, great system, just needs a more secure option to attach to the tank. I was looking for something to help automate acclimating fish and corals to may tank water, and after watching the videos, it looked like this would fit the bill. I was a little skeptical about this product after reading the reviews (see Ed’s below), but it was recommended by Ryan on BRS TV so I went ahead and gave it a shot. The day it came, I picked up some frags and a couple small fish and hurried home to try it out. The instructions were pretty straightforward. But, the “AccliStick” arrived broken in half. 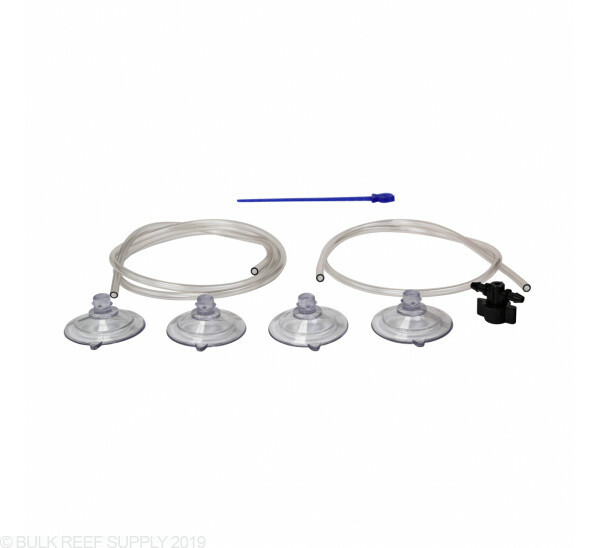 I figured I could still make it work by adjusting the flow valve; however, when I filled up the container the suction cups would not hold the weight when full and on the front of the aquarium. Additionally, one of them began to leak around the gasket almost immediately. Fortunately, I avoided a large mess, but will be returning it to BRS. They could come up with a much better design with a simple over-the -edge hanger. It would likely work OK as a fish trap, but you can get effective traps at a much lower cost. Are the suction cups definitely strong enough to hold this on the side of the tank? Reviews seem mixed. Great question! These suctions cups will be strong enough to hold this box to the side of the tank, given there are no additional weighted items inside. I would keep in mind that as with most products (powerheads, etc.) 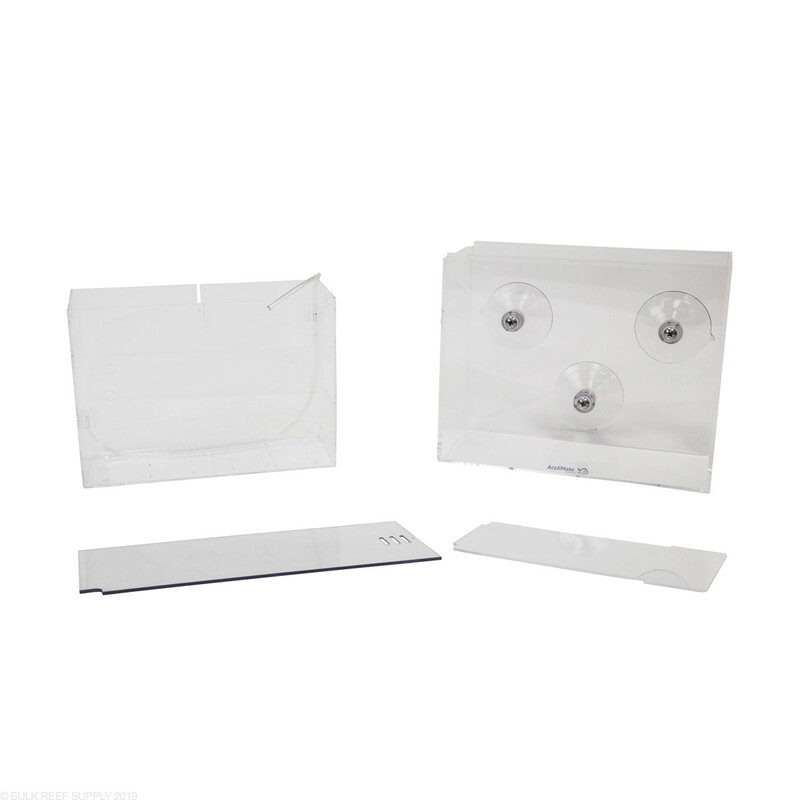 if your glass gets dirty this may impede on the ability of these suctions cups, as well as if this box is placed in front of a high flow stream after some time external pressures could loosen this. 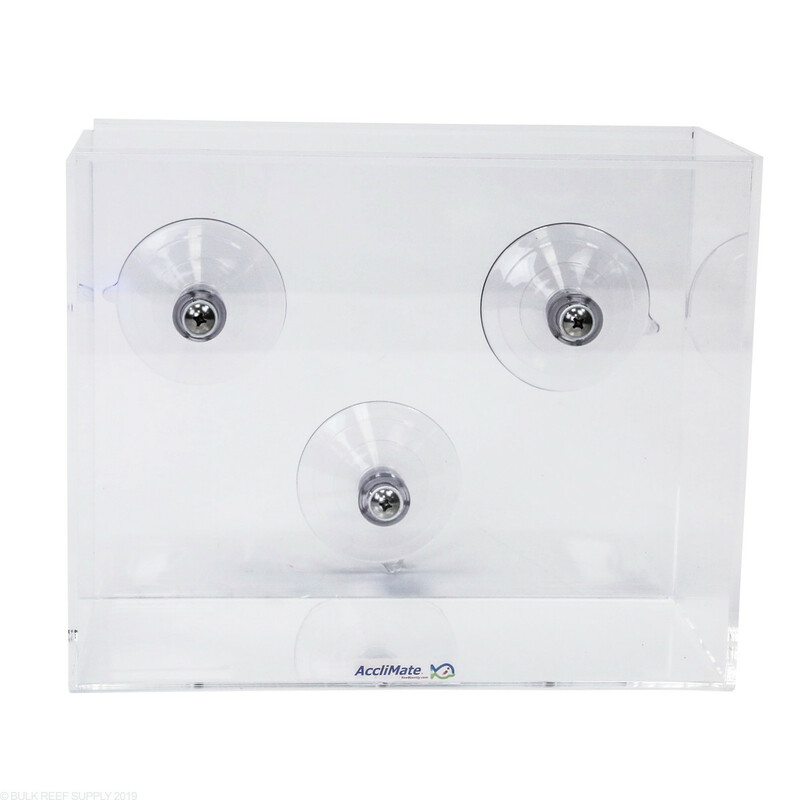 How do you keep the temperature correct in the acclimation box if placed on outside? Drip acclimation is too slow to help with temperature. What would you advise to do with this kit? Once I know, I am willing to give this a shot! The video is worth a watch for a really all encompassing instructions but in terms of your specific question, most drip acclimation is done quickly enough that the temperature won't be an issue. 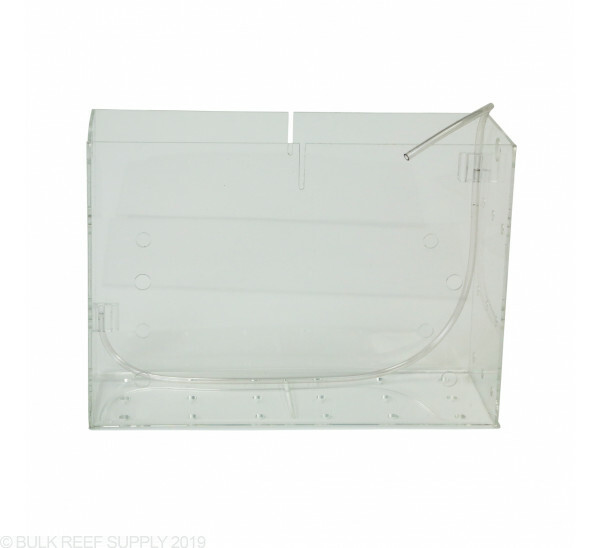 If your have a particularly sensitive piece of live stock and are doing a very long drip acclimation you can actually mount the acclimate box inside the aquarium itself.